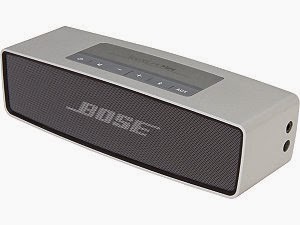 My holiday gift from 710, other than some Hanukkah Harry gifts - was a bluetooth Bose SoundLink Mini. I have played with it, although not enough. First off, the sound is really great. And while it looks large in the image, it really isn't. It is very portable, which actually is the problem. I'm so used to having stationery sound systems, I haven't moved it around where I might be and where I could possibly be using it. So it sits in our main living area. Actually, truth be told, I'm not sure to having any sound system - stationery or otherwise. With the advent of the iPod / iPhone, I don't listen to music the way I used to. At all. I haven't heard music the way it was supposed to be played in a decade. Earbuds do no song justice - save maybe something like Rebecca Black's "Friday". And even though the iPod is an inanimate object, a song like that has to hurt its feelings. Certainly the ones of the folks who created and manufactured the device. But anymore it is the car or the iPhone. Sometimes the laptop. Either way, it is limiting in terms of sonic pleasure. Ok. We do have the Bose radio in the kitchen which 710 rigged to play an iPod. But it's his old iPhone, since mine got stolen 3+ years ago. So more his music than mine, but that's ok, as it is our kitchen - not mine. And the new Bose can be linked to five bluetooth items: so right now it's my laptop, 710's iPad and my iPhone. I just need to move the device around so I can play with it more. And lately, I've been going to folk's house who are using their stereos more. I mean, receiver, tuner, and turntable. All of which we still have - though I don't think we have actual speakers anymore. Nor do we have most of our albums, as we ditched them on one of our moves - as who thought those would be making a comeback? But either at Becky's or David's the LP is making it's way back into the mainstream. Even B&N are selling classic albums like Dark Side of the Mood and Rumours. They're not issued via the normal record company, so I'm not sure how that part is working, but I really miss vinyl. I mean, not enough to go out and repurchase all my old records. And let's face it, these 51.8 year old ears can't really hear the nuances they once could. Yes, compressed music isn't all it could be via .mp3s but I'm not ready to set up a new stereo system somewhere in the house, that we wont' use that often. Until then - I'll play with the new Bose. Now, I can guess that 710 did not purchase this at the Apple store - which sells many of these types of devices. Since Apple bought Beats, their store has done away with Bose, especially since the latter is the official affiliate of the NFL. 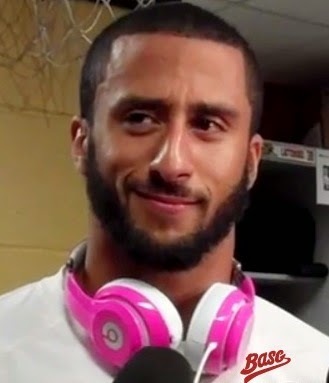 Poor Colin Kaepernick got fined $10k for wearing his Beats at an NFL event. Seriously. Of all the domestic violence, brain damage and substance abuse things going on in the NFL, wearing the wrong headphones is the fineable offense??? While he can afford the fine, it's widely known that Beats probably ended up ponying up the dough for him. Of course, I just mention all of this so I can post a picture of Mr. Kaepernick. He's nice to look at, though he's allegedly hyper-religious (along with biblical phrases tatted on his body). But I'm not looking to hear him talk. Moan maybe, but not talk. Colin is some eye candy but, seriously, a fine for wearing headphones? Oh NFL you slay me. You feature an athlete on your blog for an NFL team that is not the Cleveland Browns? WHAT IS WRONG WITH YOU?! Oh... it's the Browns. Bleh. Beats. Blergh. G-d-aweful sounding pieces of shite. Worse than earbuds. Have y'all contemplated a Sonos system? You can have wireless speakers in different places of your choosing all linked to a central system that you can link to your music device(s) of choice. I got the Bose mini color for Xmas. I use it for audio books more than music, but I love the thing.